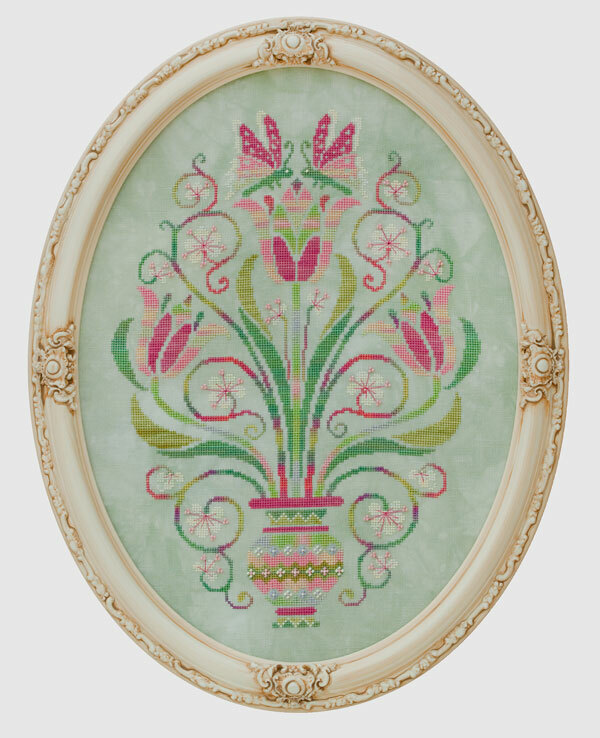 Dance of the Tulips is stitched in a palette of pastels in variegated silks of pink, teal, lavender, green and ivory. The perfect project for spring, Easter, or all year around! Stitched on a georgeous 32ct teal linen called Valor introduced by Picture This Plus in February 2010. Stitched entirely in full stitches using 7 colors of Caron Waterlilies, 3 colors of Mill Hill Beads and 1 color of DMC/Anchor for attaching beads. Fabric: Stitched on 32 count Valor Belfast Linen hand-dyed by Picture This Plus (866-314-4343). Materials Summary: A total of 7 colors of Caron Waterlilies (12-ply silk), 3 colors of Mill Hill Beads, and 1 color DMC/Anchor for attaching beads. Comparable colors from other thread manufacturers are not available due to the uniqueness of the variegated colors.